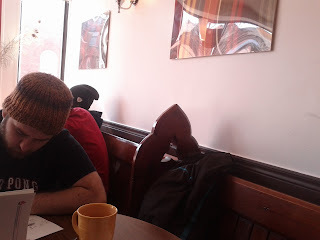 This weekend I visited a cafe in Ottawa while visiting some friends. The espresso at The Daily Grind was made properly and tasted amazing. I noticed loads of chocolate and nutty notes in the two double short I had there without a trace of bitterness. You can taste the love in every shot. Absolutely delicious! As soon as you walk into this place, you know that this is exactly what Mike, one of the owners, wants to do. His personal stamp is all over everything. An artist at heart, the place vibrates with his colour and energy. Art pencils and paper on every table is an invitation to borrow some of his creativity for yourself. Up-cycled church pews added to the artist aesthetic, and for me commented on an often overlooked spiritual element to coffee. Many coffee drinkers are as devout as your average church goer, often more so. They drink their brew daily, at regular times, at the same place(s). An enthusiastic drinker will revel in how it makes their lives better by bringing people together, and raises their energy and concentration levels to a peak. Some argue coffee has definite health benefits even if science still can't seem to come to consensus. True or not, spiritual or otherwise, the abstract photography on the walls brought me an as uplifting mindset as any church service ever has. If you didn't buy any of that last bit, they also serve food. I had breakfast tacos. How awesome is that? Very. 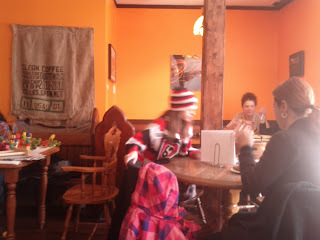 I even managed to get some great work done on a story I'm working on before this guy showed up to our table to say hi. He had a really cool hat so I had a picture taken of us both in our headgear. Later, one of Ottawa's homeless called me a space rabbi. 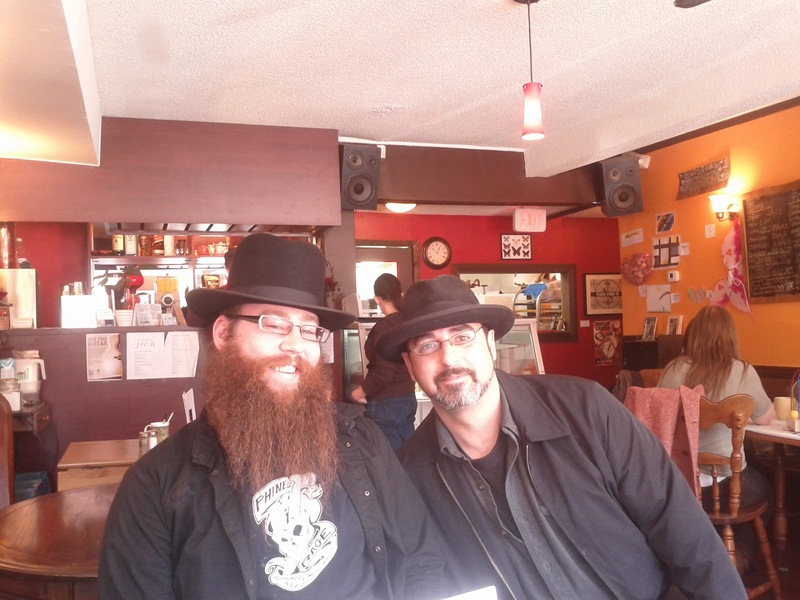 All in all, a pretty interesting trip and a neat coffee shop. It seemed like a place you'd find in Toronto, but without the requisite independent coffee shop brick wall. The Daily Grind will definitely be on my list to visit next time I make it out to that way.